The woven blue sash-left over piece from a wool skirt I’d made, the orange background from the lining of a corduroy dress I’d sewn in high school. Having sewn since childhood, I still remember walking to the store to buy lace and fabric at fractions of a yard to make doll clothes. I am passionate about textiles of all kinds and at a certain point I was making banners with recycled materials from dresses we wore. 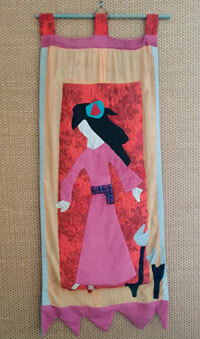 This is the first banner I made- many years ago- the pink was velour from the bridesmaids’ dresses at my brother’s wedding. The banner reminds me very much of the Japanese “Boro” tradition. Very cool. I still remember where each piece came from. Textile literally means “that which has been woven”. From the Latin “texere”, which means “to weave”. Textile consists of filaments (endless threads, like yarn) or fibers (short pieces of thread). 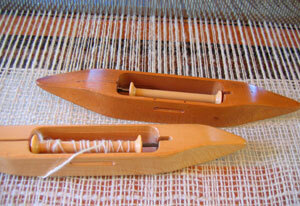 Spinning and weaving which use fibers, originated in ancient Egypt around 3400 B.C. Historically, textile fabrication met family and societal needs for clothing and home decor first. As production capacity exceeded local needs, the textiles were traded for other goods. You can see why speed in production was so important. The shuttle carries the thread. The flying shuttle was one of the key developments in weaving that helped fuel the Industrial Revolution. The picking motion no longer relied on manual skill; it became powered by machine. 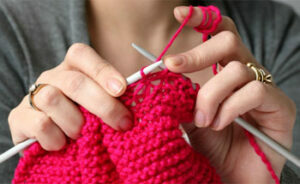 Knitting uses endless threads or filaments and creates multiple loops of yarn, called stitches in a line or tube. Here’s a DIY site called Knitting Help. Unlike textiles made from threads of different colors, Sunbrella is an acrylic material whose color is achieved by mixing color into melted polymer. (plastic) Although I instinctively dislike the concept of printing natural images on plastic, the concept isn’t bad in itself in that there’s no dye or water waste. The bigger issue is one concerned with the acrylic fiber itself. Read more here. 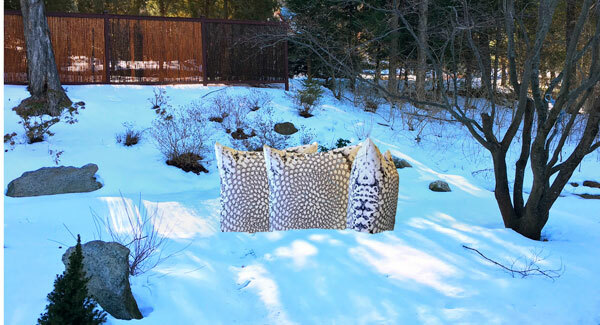 People have infrequently asked if my pillows are weatherproof- would I make them in something like Sunbrella. The short answer is no. I‘m concerned about the material and its impact on human health as well as environmental issues. You can decide if the convenience is worth it for you. I’ve decided not to go there. 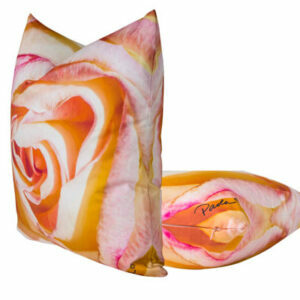 Paola Pillows are made from 100% cotton sateen. The photos are taken from flowers and plants I grow here in Litchfield. Our printer uses dyes and disposes of them and the necessary water as required by law. Nothing’s perfect but a person has to decide for herself what part of the process feels the safest overall for self, family and planet. Great things are accomplished when talented people work together. Ever heard of PostModern Jukebox, aka PMJ? PMJ is a rotating music collective founded in 2011 by arranger and pianist Scott Bradlee. This song features vocalists Haley Reinhart, Morgan James, and Ariana Savalas. Good show! Starting in 2012, PMJ put out a new video on YouTube each week, most were filmed casually in Bradlee’s living room. Many artists have cycled in and out of the ensemble performing a variety of pieces arranged by Scott. Very cool. Here’s another. Creep. You can see their tour schedule here. Oh no, North America was 2016. Oh darn, you’ll have to go to Europe. Come back soon.. subscribe to our blog!